According to the Dutch study, after birth, lingering high blood pressure is common and may go unnoticed among women because it doesn’t show up in a clinic test. Pre-eclampsia occurs in 3 to 5 percent of pregnancies in the world. 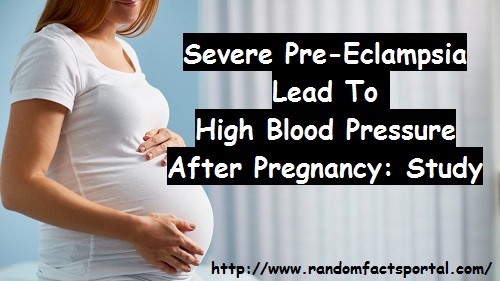 Hypertension and elevated protein in the urine during pregnancy are signs of pre-eclampsia. Around 2% of pregnant women have a severe form of the condition. It is responsible for higher risk of organ damage and smaller babies. Laura Benschop, a researcher at Erasmus Medical Center, Rotterdam, the Netherlands said that women with severe pre-eclampsia can be seven times more susceptible to develop future heart disease compared to women with a normal blood pressure during pregnancy. More than 41 percent of the women had high blood pressure in the year after pregnancy, published in the study of American Heart Association’s journal Hypertension. 1. More than 41.5% of the women had high blood pressure in the year after childbirth. 2. The most common type of hypertension was 'masked', where blood pressure is normal in the clinic but high at other times. 3. If doctors had relied on clinic blood pressure readings alone, only 24% of women would have been diagnosed with high blood pressure. 4. 45 % of the women had an insufficient decrease in blood pressure from daytime to night-time that is considered unhealthy. 5. Night-time high blood pressure that leads to high disease, stroke, and death, affected 42.5% of the women.